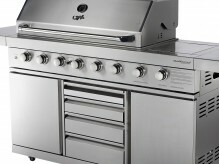 To keep your BBQ looking like it was the day it was purchased will require a little regular care and maintenance. It is important to ensure that all marks/fingermarks etc. are cleaned off the BBQ surfaces prior to first use to avoid these becoming permanently etched into the panelling. Before your first use, wash all BBQ plates, grills, warming racks and rotisserie rods/forks in warm soapy water and thoroughly rinse in clear water. There is no need to season enamel coated cast iron plates or stainless steel grills. Your BBQ should be run in on a medium heat for approximately 10 minutes prior to its first use. For subsequent cleaning of your BBQ plates and grills, we recommend removing them (once cooled down) from the BBQ and immersing them in cold, very soapy water in a laundry tub or large plastic bin. A normal kitchen scourer will have your plates clean in no time at all. (Using cold water will stop the grease attaching itself to either the laundry tub walls and bottom or your hands. Instead, it will coagulate with the soap suds and will then be drained away) Then simply rinse off in clear warm water and rest them upright outside the BBQ for half an hour to dry. Removing the plates will also give you easy access for cleaning of the combustion box area where baked on fat may require an oven cleaner that is safe on stainless steel, or some fine grade steel wool to remove the build up. Always rinse well when using chemicals in your BBQ. Occasionally, you should also remove the flame tamers and wash them the same way as the plates and grills. Do not use abrasive cleaners or scourers of any type on screen printed areas of the control panel as you risk rubbing off the printing over time. A sponge and warm soapy water is all that is needed to clean this area. Stainless steel, contrary to its name, can be tarnished and corroded by impurities in the air and acid rain and is therefore not warranted to be immune from such. However, with simple and regular cleaning by wiping down with a soft cloth and warm soapy water followed, once dry, by an application of a good quality stainless steel cleaner/preserver, you will keep your BBQ looking great for many many years. If you do ever need to use a heavier duty cleaner to remove corrosion spots caused by pollens, salts and tannins etc, normal household Jif applied to a damp soft cloth will generally do the trick. Don’t forget – always rub in the same direction as the grain in the steel and never in a circular motion. And remember – always replace your BBQ cover once your BBQ has cooled down and gas is turned off – at the bottle first and then the burners. Keep the gas bottle upright at all times (particularly when transporting) and store in a well ventilated area. Gas bottles are certified for use for 10 year periods and will require recertifying once they reach this age. When transporting, keep car windows open and do not carry the gas bottle in a plastic crate as static electricity can build up. When connecting the bottle to the BBQ spray both connections and valve area with soapy water and check that no bubbles appear. If bubbles do appear, it indicates that there is a gas leak and you will need to check all fittings and rubber seals for signs of damage. Ensure the gas hose does not have a kink in it. Also remember that many gas fittings are a reverse (or left hand) thread. This is usually indicated by notches in the brass nut.